-- Select a Size -- Micro Size 2 Tiny Size 4 - Out of Stock! Size 6 - Out of Stock! Size 8 - Out of Stock! Size 10 Size 12 Size 14 Size 16 Size 18 Size 20 Size 22 Size 24 Size 26 Size 28 - Out of Stock! Size 30 - Out of Stock! 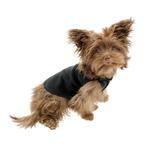 The Gold Paw Fleece Dog Jacket in Black is the perfect snuggle wear indoors and out! The Gold Paw Cozy Fleece Jacket in Black is a lightweight fleece pullover for every pet - and it's made right here in the U.S.A.! 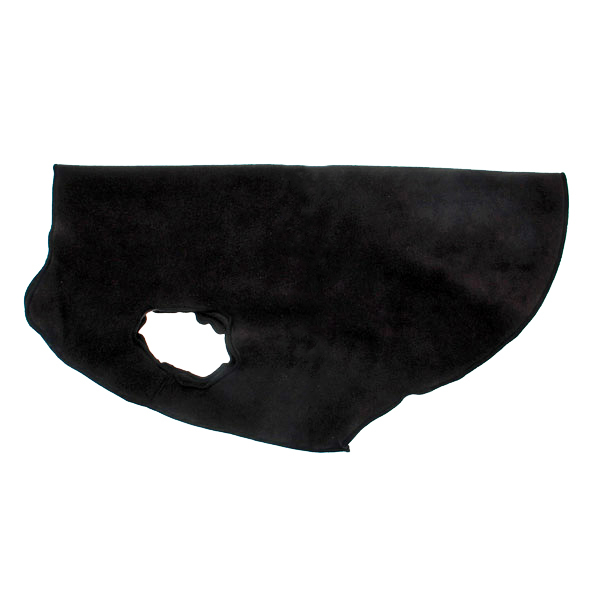 Our Gold Paw Fleece features a simple pullover style with no sleeves or lumpy hook and loop tape to mess with. The soft, luxurious fleece features a four-way stretch for the ultimate in comfort and fit. The finish is unbelievably soft, like velvet. It’s a piece of cake to put on and moves with your dog, making it the most comfortable pet attire around. 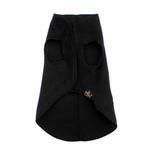 The collar can be worn up for extra warmth or folded down for a charming style. 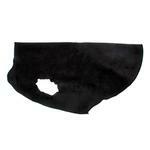 The high-cut tummy keeps your pet clean and dry with enough chest coverage for warmth and protection. We love this lightweight fleece both for indoor or outdoor use. It's great for older or short-haired pets, or dogs or cats recovering from surgery or illness. The cozy fit may reduce anxiety in some pets, especially when worn one size down. This soft, flexible material is gentle enough for the most tender pets including tiny puppies and hairless dogs and cats. You'll love the classic look of this black fleece pullover. It will carry your pet from fall to spring. Available in multiple colors and sizes so everyone can be warm and cozy. Gold Paw Fleece Dog Jacket - Black Customer Photos - Send us your photo! Henry loves his new coat. The fleece is super soft and stretchy which is hard to find for big dogs. Now I don't have to worry about him getting cold at night if he uncovers himself. Love this coat! The boy's love their Gold Paw Fleece. We have several, and they wear them constantly during winter. Posted On 03/09/19 by KRYSTAL D from FLORA, IL Yes, KRYSTAL D recommends this product! Love these Gold Paw fleece! Cant have to many of them ! They are so soft & easy to put them on our boy doxie! This black color looks great on our red mini boy doxie! Posted On 02/07/16 by Lisa from , CA Yes, Lisa recommends this product! Wonderful product!!!! Would buy again! Fit perfectly according to sizing guide! Size 16 fits our rat terrior just right!!!!! This is my second purchase of this item, only in a different color! Love the stretchy fit - very stretchy so you can buy a bit small and it will fit tight - a very good feature for barrel-chested dogs that are hard to fit. I got an orange one last year on sale - it is much better-looking in person than online - and liked it so well, I bought another at full price. Love the black one on my black hound dog - it's virtually indistinguishable so she is warm incognito and not dressed up or silly-looking like some big dogs can look with clothes on. Posted On 10/15/15 by Pamela A from Killington, VT Yes, Pamela A recommends this product! This is the best jacket I've seen. Very stretchy and cozy. My kitten didn't know he had it on! Posted On 02/08/15 by Patricia G P from Longview, TX Yes, Patricia G P recommends this product!